Here is a good CBS 60 Minutes show about the terrors of metal mining in the Congo. 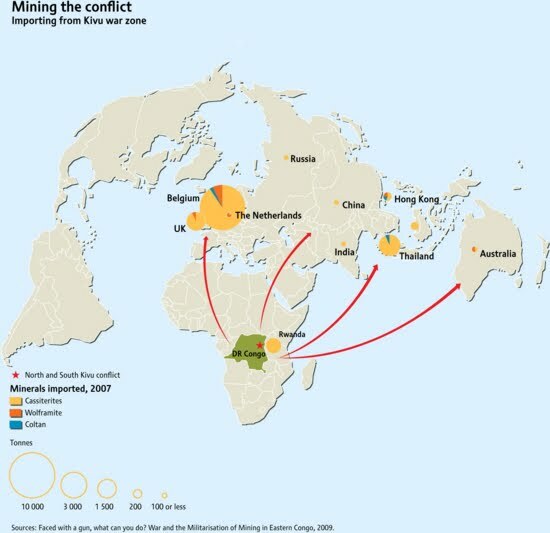 Here is another report from the United Nations, which connects the conflict mining to the electronics producers - the stuff we throw away as "e-waste". Urge your Representative: support efforts to break the chain binding mining and human rights violations. If signed into law, HR 4128, the Conflict Minerals Trade Act will identify goods imported into the United States that contain conflict minerals. This transparency would be a significant step toward breaking the links between metals mining and human rights abuses in Congo. Fatboy Slim, the Beatles, and International Digital Coops. This video has nothing to do with recycling, electronics, or "e-waste". It has to do with world music. It's an AIDS awareness video sponsored by Starbucks Coffee, filmed in 156 countries, showing brief covers of the Beatles "All You Need is Love". It also has a lot to do with affordable internet access. I just recently found out that the song below, "Praise You" by Fatboy Slim, was recorded for the video by Spike Jonze in "guerilla style"... without much planning, and that yes it is the official Fatboy Slim video release, but no, it isn't faked, the director just did this at this shopping mall and they left in the part where the store owner came and turned it off. Here is a Japanese cover song of "boulevard of broken dreams", the Green Day song. Green Day played on the Boston Esplanade when I worked as Recycling Director at Masschusetts DEP. I have put several posts on our "Fair Trade" program. WR3A finds contract assembly factories, usually for monitors (though we have also worked with computer power supply and drive refurbishers). We offer them incentives to allow audits of their processes, and financial rewards (cheaper goods) if the factory gets ISO14001, changes downstream management of scrap, etc. After several years of progress, improving jobs and lives and costs of recycling, we are hearing that some of the factories want to go back "underground". While they have put in CRT glass processing, gotten ISO, etc., the word on the street is that Basel Action Network's new tactic is to write to the government of every country which has contract assembly, accuse the factories of illegal operation, and attempt to get legal factories declared illegal. WR3A has just had a factory cancel a second visit, citing fear that our auditing and reporting would disclose their operation and cause their permits to be revoked. Will "Green Arrogance" defeat fair trade? Has "stewardship" become an autoimmunity disorder? BAN objects to any insinuation they had something to do with Samsung Corning's halt to importing USA CRT glass. They have threatened me, in fact, for saying they had everything to do with it. BAN has many good points to make. The export business needs to be reformed, and I have long applauded BAN for their role in reducing "toxics along for the ride". But while the export business needs to be reformed, BAN is attacking repair and refurbishing businesses, and CRT glass-to-glass operations, and the only beneficiaries are mining and disposal. To borrow a phrase from John Stewart's Daily Show, aimed at Fox News, BAN is "producing way to many antibodies". BAN is, in fact, attacking legitimate recyclers left and right, and driving the market back underground. BAN is the lupus of environmentalism. You cannot have missed the press about the crackdown on immigrant paperwork in Arizona. The Governor has signed a law (repeatedly vetoed by the past Governor) authorizing municipal, local, and state police to request "legal paperwork" on people who "appear" to be illegally in Arizona. This should not, on the face of it, affect Retroworks de Mexico. Our whole recycling operation is about creating jobs for Mexicans inside Mexico. NPR's Marketplace profiled one of our staff, Virginia (Vicki) Ponce last summer, talking about how happy she was not to need to cross the border, to be doing recycling work in her own town. We are able to recycle televisions more affordably in Mexico because the TV broadcasts in Mexico are still NTSC analog - not digital. We are offering a "cash for clunkers" program, where we take in one junk TV from inside Mexico for each USA TV we sell for reuse. Unfortunately, the Arizona law probably WILL affect us. In order to manage the complicated import and export work for maquila companies, we have rented a large warehouse in Douglas AZ for the driver to sort the loads, ensure there are no illegal wooden pallets, and to verify that each TV is scrap or reuse (a huge difference in tariffs). Last winter, one of the staff who came to see the goods in Douglas was stopped by customs and accused of "working" in the USA, and his visa was taken away. We also re-transit the goods from rejected TVs back to the USA - CRTs, printed circuit boards, yokes, degaussing wire... while we are waiting for Mexico's SEMARNAT to re-issue our permit for final recycling of CRTs in Mexico (at the smelter), we must re-transit the goods by truck and our truck drivers (from Mexico) must unload the goods back at the USA warehouse in Douglas. The laws on maquilas are clear... a shipment from the USA company to the Mexican maquila is considered an internal shipment from one office to another. The same company employs people on both sides. It is impossible to switch drivers right at the border. What is needed is for the USA to create more working visas, and to give them out. Then you could offer all kinds of incentives. By issuing no work visas, the USA offers no incentives for Mexicans to apply for them and to obtain them legally. I just hope that I get stopped, so I can refuse to show my paperwork. If enough Americans refuse to show their paperwork and allow themselves to get arrested, it would be a great passive resistance to the Arizona law. My preference is not to have passive resistance, however. My preference is to have a normal policy where companies in the USA, especially companies with both a USA and Mexican factory, can just obtain a normal working visa for our Mexico staff. We already hire the best and the brightest, and create jobs for law abiding women. The folks we bring in would be the cream of the crop, the people who made America great. Another Fair Trade story about how "e-waste" can have positive outcomes. With the right people in charge, recycling and repair and reuse can create better jobs, even in South Africa. I'm leaving to tour two additional factories in Asia which wish to refurbish computer monitors. They need an additional 100,000 per month (which they currently buy from non-WR3A, non-audited operations). WR3A is willing to provide the CRTs at a reduced fee in return for getting the factories to full R2 standard, in addition to the ISO9000 and ISO14001 they already had to put in place for the contract manufacturing contracts they did as a subcontractor for multi-billion-dollar OEMs. The ideal place to get the CRTs is California. If California will make a very simple change in interpretation of the "cancellation" language, to allow either "vacuum seal" damage OR shipment for complete remanufacturing at an audited facility, WR3A will pay CA or its processors per qualified CRT. As it stands now, we can pay them, but not as much as SB20 pays the companies to break them. So California SB20 Processing Rules ALLOW the broken CRT tube to go to be remelted into a new CRT tube in Malaysia, which is assembled elsewhere in Malaysia in the SAME FACTORY WR3A ships to, but California does not allow the SAME FACTORY to buy the CRT tube intact. CA is subsidizing a broken hierarchy, and passing the costs to manufacturers and retailers and consumers. The outcome is that CA taxpayers have to cover the lost revenue from reuse and the cost of processing good stuff, and the factories overseas have to replace the CRTs from smugglers who don't offer them any fair trade incentives, who don't remove bad units, and who send "toxics along for the ride". Cost to California taxpayers? About $1 million dollars per month. Cost to overseas refurbishers? They have to pay more, and to accept worse units. Cost to internet access? PRICELESS. Here are some photos of the process WR3A uses to put refurbished CRTs into the new monitors instead of broken-melted-new CRTs into the same monitors. The assembly takes place at the SAME FACTORY. In a press release today, Basel Action Network, the "watchdog that barks at everyone and everything" re-publishes their tired estimates that about 80 percent of what consumers deliver to "e-waste" or electronic scrap recycling programs is exported to developing countries. BAN repeatedly states that 80% of USA material is exported, and that 75% of those exports are environmentally damaging. By extension, BAN implies that if Target Stores do not tell BAN who their electronics recycling company is, that Target is doing something wrong. The intention is to hurt sales at Target, and to scare other manufacturers and retailers into using a set of vendors who pay money to the watchdog BAN to "audit them". Meanwhile, BAN has published a list of their own "e-Stewards" which they had never themselves audited, most of whom were sending CRT glass (properly! in a manner good for the environment) to Samsung Corning glass-to-glass recycling in Malaysia. (BAN has stated that I have no proof that their e-stewards were exporting CRT glass to Malaysia or working product to refurbishing factories). No one doubts that I have my facts straight. No one doubts that BAN issues press releases based on innuendo and misleading, made-up statistics. 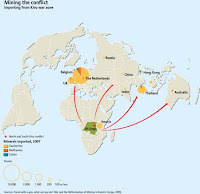 Where companies like mine are on the fence, it is who is our bigger threat - USA companies which export improperly, or BAN? My company exports to our Las Chicas Bravas factory in Mexico, and to our audited ISO14001 permitted remanufacturing takeback partner (and former computer monitor manufacturer) in Malaysia. I don't like that other recyclers under -charge and send junk as "toxics along for the ride", and I used to appreciate BAN for creating barriers to that practice. But over the past few years, BAN has spent most of their time targeting good people - Dave Dlubak, Samsung Corning in Klang Malaysia, PT Imtech of Indonesia, EPA's Robert Tonetti, Unicor, and now the Target company. BAN's lack of transparency is troubling. BAN has written the government of Malaysia to protest proper recycling of CRT glass in a glass-to-glass process at Samsung Malaysia (turning CRT glass into new TVs), falsely alleging that most of the CRT glass contained cadmium phosphors (cadmium was a rare earth metal used in some color CRTs in the 1960s). BAN has attacked Dlubak Glass for properly recycling the bad glass which is properly removed from the very export loads which BAN claimed contained the bad CRTs which Dlubak Glass was domestically recycling. BAN has written the government of Indonesia claiming that CRTs sent to a contract manufacturing plant for refurbishment were "hazardous waste", causing 9 containerloads to be returned to the USA at a cost and disruption to both the refurbishing factory and to the USA EPA and Homeland Security office. BAN has written an opinion piece in a trade journal which basically stated that the repair and refurbishing operations which I have posted film and pictures of on this blog and other websites are "poisoning people" in other countries. BAN has viciously attacked EPA for its standard of considering working and repairable computers exported in compliance with Basel Convention Annex IX to be commodities, not wastes. The Basel Convention itself explicitly states that parties "may consider these items commodities and not wastes". BAN has made a presentation to African officials in Accra misleading them to believe that the Basel Convention requires tested working product, rather than "export for repair and refurbishment". Hear this: BAN has no written evidence for either of their statements, that 80% is exported, or that 75% of exports are bad. They make it up. See the highlighted segment of their press release below... "According to BAN, ...BAN estimates that..." They cite themselves as a reference. NO data. BAN led CBS 60 Minutes reporters away from the Guangdong computer monitor refurbishing plant to a site in Guiyu which does not take or accept computer monitors. 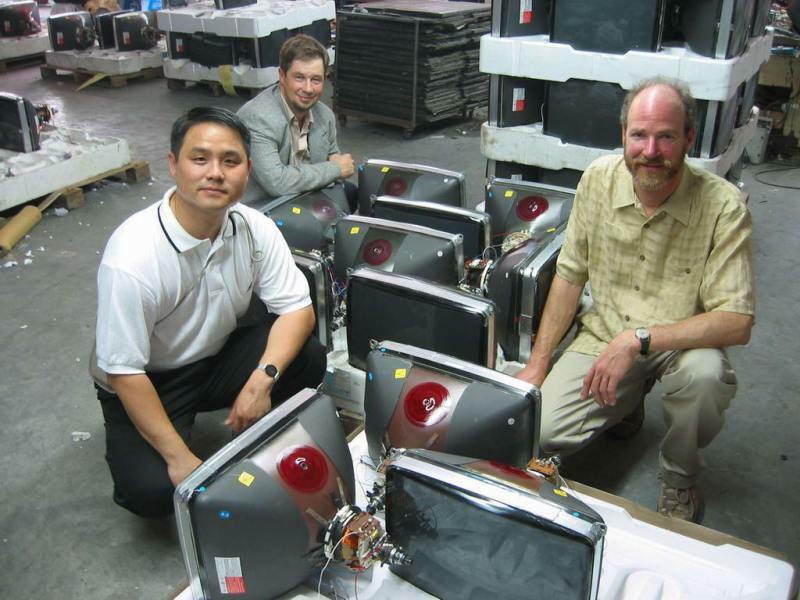 CBS got a Peabody award despite having photographic evidence that the CRTs in Hong Kong went to a professional refurbishing factory. Now everyone is afraid of BAN. I believe less than 80% of material collected is exported unprocessed (if you include clean scrap steel and glass-to-glass CRT recycling, it's possible) and that far, far less than 75% of those exports are bad. Every week, I post photographic and written evidence of our end markets. I have no idea who Target is using as a vendor. It could be proper exports, it could be 30% improper export, it could be all domestic. What they are being accused of is not telling BAN where their market is. Given BAN's attacks on my company, on Dlubak, on EPA, on repair factories overseas, and on the glass-to-glass end markets which their very own "e-Stewards" have been using, who can blame Target? BAN is responsible for California SB20 destruction of millions and millions of dollars in working video display devices. They have spurned our invitations to sit down with the United Nations and CA officials to promote export of working product to people who need these to get online affordably. These guys are loose cannons. No wonder no one at Target will answer their question. BAN volunteers have probably called me and my own company, fishing for evidence they can use to slam us with false accusations. They are probably buying repairable product through domestic sources to re-export it and accuse me of being the exporter of bad product. Meanwhile, one of their e-stewards is offering to recycle from all of my clients at a predatory price of 1 cent per pound, which puts enormous pressure on my company to cut corners. Jim Puckett and Sarah Westervelt at BAN have fooled CBS, they have fooled National Geographic, they have fooled African import regulators. They put financial pressure on companies like mine to cut corners, then ask my company to pay them money. They are bullies, and they have stopped being misinformed - they know that factory refurbishing is legal - and now have crossed the line by reporting containerloads contain waste material they have not seen. The GAO Report which BAN repeatedly cites does back up some of BAN's claims, but also clearly stops short of the conclusions BAN jumps to. 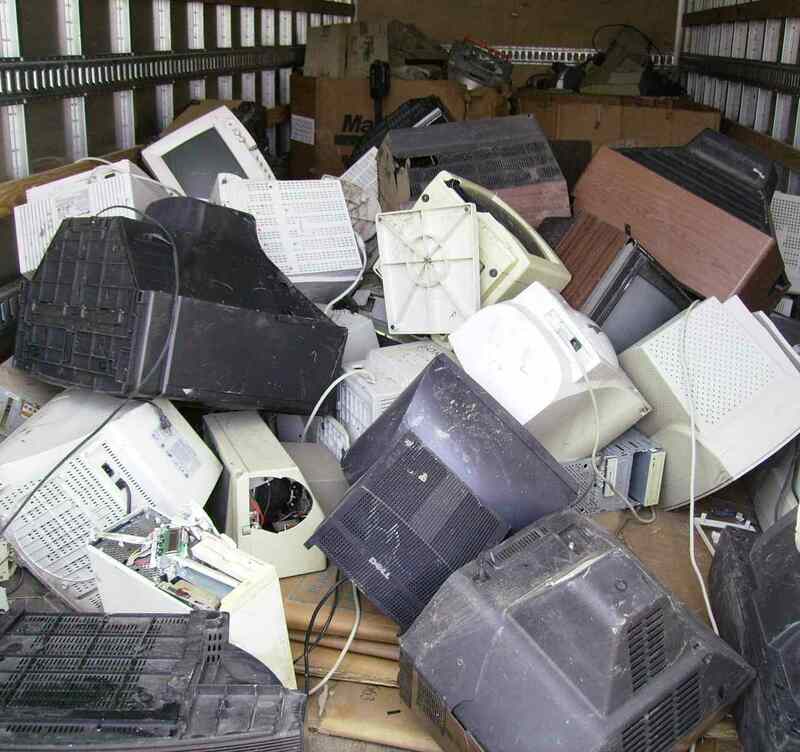 The main problem with that report was that they offered to pay more for broken CRTs than the market would ever pay for, which created a false impression that fake recycling could reach 80% levels based on free market prices - we have shown that more than 50% junk is almost impossible to export based on the cost of shipping alone. BAN claims that repairable products which contain a non-working part sent back to a manufacturer (e.g., under warranty back to the same place that made it) is an example of "toxic waste export", and that CRT glass shipped back to a CRT glass maker for remelting is a "toxic waste export" - those are the only ways they can approach the 80% export numbers they claim. In the past I have been pleased to hear the watchdog bark at my competitors who were exporting far more than the 22.5% my company exports. But lately, the same watchdog has been biting my friends, and barking at complete strangers who they admit they don't know the practices of. A growing number of consumers are realizing that buying a product means taking full responsibility for that product, even when it is no longer useful. This is particularly important for goods like electronics that contain hazardous materials that are detrimental to the environment when disposed. Exposes on60 Minutes, Frontline, 20/20 and others have documented how most electronics collected for ‘recycling’ in the US are shipped to developing countries where the hazardous materials are destroying the environment and poisoning workers and residents. Toxic trade watchdog group the Basel Action Network (BAN) was alerted to the problem when e-Scrap News, a trade journal for the electronics recycling industry, reported that Target “did not say” who would be doing their electonic waste recycling. BAN aimed to find out if anybody in Target stores or headquarters would say. BAN volunteers made inquiries in person and by phone to Target stores in 12 different US cities and to Target’s Minneapolis headquarters. In every case, Target employees were either unwilling or unable to say what would happen to the toxic e-waste Target is collecting nationwide. According to BAN, this lack of transparency about how the used electronics would be recycled is alarming because BAN estimates that about 80 percent of what consumers deliver for recycling in programs such as these is exported to developing countries. In 2008, the Government Accountability Office echoed BAN’s concerns and reported that the US government does not adequately regulate and control irresponsible and environmentally damaging toxic e-waste exports. Private data is often left on hard drives and phones, creating opportunities for fraud or identity theft. Or the waste can be diverted to municipal landfills or dangerous prison operations. BAN recommends that the public always avoid any e-waste collection program that will not provide data destruction or assure full transparency and instead use recyclers that will not export hazardous e-waste to developing countries. Last week, BAN launched its e-Stewards Certification program to identify recyclers who manage e-waste in a globally responsible manner. That program has been endorsed by over a dozen leading corporations and nearly 70 environmental groups worldwide. “The public needs to be vigilant not only with Target, but with any e-waste collection event or program,” said Westervelt. BAN documented public inquiries to Target Stores in the following cities: Houston, Texas; West Houston, Texas; San Francisco, California; Westminster, Colorado; Atlanta, Georgia; Granger, Indiana; Vestal, New York; Portland, Oregon; Dickson City, Pennsylvania; Tacoma, Washington; Seattle, Washington and the Minnesota, Target headquarters. To contact any of the volunteers to hear their story, call BAN, 206-652-5555. Robin Ingenthron (left) of Good Point Recycling in Middlebury and Lee Tuure, operations manager at the Chittenden Solid Waste District’s drop-off center in Williston, load up a truck with e-waste Monday. Gov. Jim Douglas signed an e-waste bill Monday at the facility. MONTPELIER — Vermonters will have an easier time recycling their old, unwanted televisions, computers and printers with a law Gov. Jim Douglas signed Monday. The bill puts the burden of paying for recycling the electronic waste on the manufactures of the products, who must register with the state and pay a $5,000 fee starting in July, with an annual fee to be determined next year. The money will go to make free recycling drop-off centers available in every county starting next year. Currently, fees to dispose of electronics at Chittenden Solid Waste District drop-off centers run from $1 for a keyboard or a computer mouse to $15 for large TVs. Vermont is the 21st state to adopt an e-waste law. Solid waste districts and municipalities had paid for recycling programs previously. The state generates about 1.5 million tons of electronic waste a year, said Clare Innes, spokeswoman for CSWD. Innes noted that because manufacturers will have the responsibility of paying for recycling, they will have incentive to make the products last longer and to build them with fewer toxic substances. An LCD TV , for example, contains 22 lamps with mercury, requiring the TV to be dismantled to reach the bulbs for recycling, she said, citing information from the national group Electronics Takeback Coalition. “We have no control over how these products are designed, manufactured, marketed and sold, but ultimately it is local government that is left with trying to capture and recycle these products when they are being discarded. This legislation changes that model and provides the consumer with a convenient and consistent statewide collection system that we lack today,” said Jen Holliday, CSWD environmental and safety compliance manager. 1) "Ain't broke." Before the bill, 84% of Vermont residents already had convenient 6-day per week access to television as well as computer recycling. The other 26% includes people with 2-day per week access, a couple of places relying on one-day events, and places which refer residents to another county. This improvement could have been accomplished with a waste ban. 2) "Not visionary." If Vermont was going to draft a law, I would have liked to have put the fees on operating system software and other media which creates the obsolescence. The description of "manufacturing" by the bill's proponents is quaint. Cassette player manufacturers will not know CDs are coming, there is no behavior change apparent from manufacturers as a result of these bills. The third was a point where Vermont did break with the national trend. Because of the economy, local aid issues, etc., a bill was going to pass. However, the Vermont S.77 proponents (Jen Holiday and VPIRG) did compromise on "obsolescence in hindsight" language by agreeing on changes to the bill which freed manufacturers from "anti-trust" laws and which would have penalized repair and reuse. So this bill S.77, which will be signed today, has improvements and I'd suggest it be looked at by other states if they are set on entering into the 'e-waste' business. Follow the link for a full redline and strikeout version. This will allow recyclers of product in Vermont to do whichever the manufacturers demand - destroy working product is still ok, but the manufacturers will have to PAY the cost of destruction if that's what they require. If the manufacturer allows R2 compliant resale and repair of products with demand and key functions working, then those manufacturers will benefit from the resale value when paying for their equipment to be recycled. My Vermont company just returned from a weekend e-waste recycling event on Long Island. People waited in line for an hour, and they told us as we were unloading, "this still works", and "do you know anyone who needs this computer or are you going to destroy it?" People in all areas know in their guts that destroying working product is not in anyone's interest. Whether or not they have read Vance Packard's 1960s book, "The Waste Makers", they like the idea that maybe, just maybe, this TV won't get smashed or shredded, but will be used to upgrade some poor person's TV in Mexico. And the money saved can be used to recycle Mexico's own waste electronics. Vermont is the first Product Stewardship Bill state to look OEMs in the eye and say "We are not going to require these products be destroyed. You want them taken off the market? That's at YOUR expense, not ours." Expect HUGE news from WR3A this summer. Oscar (Mexico), Hamdy (Africa), and Robin eating Sushi. Our woman environmental officer from Malaysia scopes out the countryside in Sonora. The Chicas will need a bed and breakfast for all the visitors. United Nations, University of Vermont, Cameroon Africa, Korean retired VP of Hyundai, United Nations digital divide group, meet in Middlebury. 3) Since no one at the internet cafe is using a new computer, then exports lead to development. Neither of these is science. Either one, by itself, is a waste of airplane fare. You need the total number of containers shipped, assume 30,000 lbs per container (some are 20' containers, some are 40'), look at the dollars, and deduce the dollars per pound. Then you get copies of the purchase orders. You estimate the weight of the junk at the landfill, you estimate the count of the computers in the internet cafes, and visa versa. What you find is not a black and white picture. You find good, bad and ugly - the ugly being dirty and difficult recycling jobs that are better than the alternative, the good being internet and repair and reuse, and the bad being "toxics along for the ride". Under no circumstances is a no export policy the right solution. That is exactly the stupidest solution. You need better people to participate in the trade, and to encourage goodness. Unfortunately, Kenya and Egypt are banning the import of used computers. Tragically, USA non-profit organizations are applauding this. C-Corporations, 501-(c)3 Non-profits, meet "B-Corporations"
Read this AM about Vermont Bill S.263. One important thing I learned in my 30s and 40s was that if you have a "one in a million" idea, and there are 6 billion people, that statistically there are 6 million other people with the same idea or inspiration. If you apply "One percent inspiration, 99% perspiration", then of those million people, ten thousand of them have the energy and guts to pursue their good ideas. In the past, there was a huge advantage to being born in a country which had other inspired and perspired people. Kind of like going to college may not make you smarter than going to the library, but you are more likely to meet other people you need to test and vet your ideas. That's a bit of a long preamble to the press release below, which I could see as uniquely targeted at Good Point Recycling and American Retroworks if I was 18 years old. The folks at Certified B-Corporation, among others, realize that the old "non-profit" and "for-profit" labels of the 1970s and 80s were not very good predictors of who actually had an impact on GOOD. I ran Retroworks as a non-profit, and ran it as a for-profit, and I made more money and did less GOOD as a non-profit. As a for-profit, I pay taxes and employ more people and can use growth as momentum to leverage loans rather than "donations". For our presentation at Investors Circle last year, we pre-qualified as a B-Corporation but balked at paying for the cost of actual certification (a bit like an operation which is "R2 Compliant" without paying for R2 auditors). We switched from a non-profit with another non-profit "fiscal agent" in 2001, and the power and energy unleashed us to make Retroworks de Mexico, WR3A, and to bring ISO14001 and R2 standards to trading partners overseas. My company was a "Benefit Corporation" before this law was passed or this term was coined or there was a choice between for-profit and non-profit incorporation. The challenge now is to maintain the healthy skepticism of green-washing (you can form yourself as a B and then emerge from a mistake to find you are in debt and unable to do well by doing good). I distrust any "snapshot" approach to vetting people or corporations. Businesses change. People change. Recordkeeping and transparency are the key. I assume the Benefit Corporation laws will have rules about those records, like 501-c3 laws do for non-profits filling out Form 990. But the Form 990 is a pretty limp ruler, which measures Salvation Army and Planet Aid without the ability to distinguish much between the two. So I live and love the idea of the Benefit Corporation. But as soon as there is an outside reward for being one, greedy people and incompetent people will follow us. College Admissions standards work well enough (if imperfectly) as a predictor of 4-years of academic performance. But they have the benefit of selectivity (the more people apply, the easier for the college to score well on that standard) and also the benefit of only predicting 4 years of behavior. I guess ideally, there would be a strong competition for B-Corp status, kind of like the EB-5 Visa program (admission to USA investment visas, there is a certain number available, so it creates competition among foreign investors). But I think there would be a massive screeching if the IRS tried to limit the number of non-profit corporations, or heaven forbid, take some old 501c3 status away based on actual performance (they can get taken away for fraud from time to time, but even that is rare). I am simultaneously delighted with the Benefit Corporation and skeptical that a government tax status will do anything more for the B-Corps than 990s do to keep out lazy and inept tax dodgers from the ranks of spiritually motivated, honorable non-profiteers. Article below. Back to the battle of hard work. April 13, 2010 - Annapolis, MD: Maryland Governor Martin O'Malley signed into law the nation's first legislation creating Benefit Corporations, a new class of corporations required to create benefit for society as well as shareholders. "Milton Friedman would have loved this," said Andrew Kassoy, co-founder of B Lab, the non-profit that drafted the model legislation with William H. Clark, Jr., partner in the Corporate & Securities Practice Group of Drinker Biddle and Reath. "For the first time, we have a market-based solution supporting investors and entrepreneurs who want to make money and make a difference," Kassoy added. The new law addresses a long time concern among entrepreneurs who need to raise growth capital but fear losing control of the social or environmental mission of their business. These entrepreneurs and other shareholders of Benefit Corporations now have additional rights to hold directors accountable for failure to create a material positive impact on society or to consider the impact of decisions on employees, community, and the environment. From a company's point of view, the new law empowers directors of Benefit Corporations to consider employees, community and the environment in addition to shareholder value when they make operating and liquidity decisions. And, it offers them legal protection for those considerations. "Today marks an inflection point in the evolution of capitalism," said B Lab co-founder Jay Coen Gilbert. "With public trust in business at an all-time low, this represents the first systemic response to the underlying problems that created the financial crisis -- protecting companies from the pressures of short-termism while creating benefit for shareholders and society over the long-haul." "This is a great moment in the evolution of commercial life in Maryland and America," said Senator Raskin. "We are giving companies a way to do good and do well at the same time. The benefit corporations will tie public and private purposes together." Maryland is the first state to pass Benefit Corporation legislation, but others are quickly following Maryland's lead. Vermont Bill S.263, co-sponsored by Senators Hinda Miller and Peter Shumlin, has already passed the Senate and will be considered by the Vermont Assembly over the next 30 days. Other states considering the legislation include Colorado, New York, North Carolina, Oregon, Pennsylvania, and Washington. We are not in denial that bad stuff is shipped in the export market. What we promote is a different standard, "fair trade". We are asking activists at NRDC, BAN, SVTC, and ETB to stop misrepresenting the Basel Convention as saying "fully functional" and "tested working". You can use the ingenuity and efficiency and value of the repair market without shipping "toxics along for the ride". Of course, given no other choice, the demand for affordable internet will replace the monitors which "E-Stewards" shred. Even more junk flows overseas in a "war on internet" approach. Most people in the industry agree with me (at least, most who have not already put in a million dollar shredder). But they are afraid of bad press, afraid of getting put on 60 Minutes, afraid of miscommunication with a non-English speaker. Technician in Egypt repairs plastic on a monitor casing. Technician trains second technician to repair circuit board. These monitors were pre-inspected in a visit by the Egyptian buyer, who helped train our staff in Vermont to identify which cosmetic fixes and which repairs were possible. We removed the ones "in doubt" and recycled those in the USA. We exported only 22.5% of all the material we collected as "intact units" for repair and refurbishment, and only shipped "Grade A" quality to Cairo. This operation was closed down in 2008 when Egyptian customs changed their enforcement. Under Basel Convention, Annex IX, B1110, this is legal. Crystal Clear that this is legal. 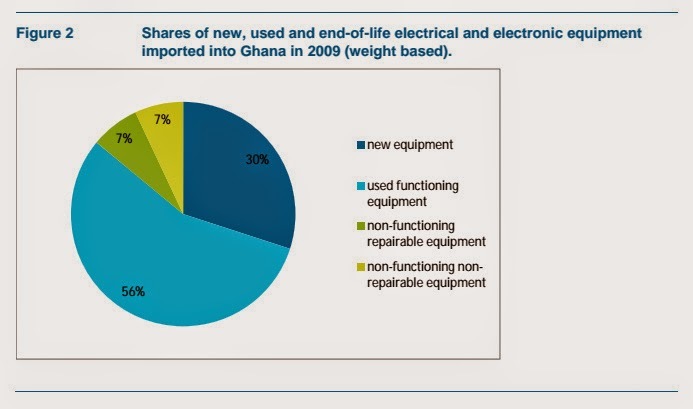 But the fear of western "dumping" of e-waste is being sold directly to African governments by BAN.org, see Jim Puckett's presentation in Ghana, see BAN's "tested working" and "fully functional" definitions. I used to get monitors from BAN Pledge signers for this market. All of them have now stopped shipping their grade A monitors, and the "no intact unit" policy invented in California for SB20 is contagious. The number one cause of death of women in Cairo is bleeding in childbirth. The BBC reports that the country needs to computerize its blood bank. That project would probably be done at the University and medical school in Cairo, where the Technology Mall is located close by. The owner of this repair shop is a med school grad, as is his brother. Last week WR3A was invited by two separate companies to visit a factory in Indonesia, described as an infernal polluter by press releases by environmental organizations BAN, NRDC, and Electronics Takeback Coalition. It is kind of surreal that my small Vermont organization is called on to vet operations halfway around the world. We are insufficiently funded to do this kind of work, and we don't have a lot of authority. But the patterns of McCarthyist "export" accusations make me want to go. Doing additional research, I found more press today, this time from Takeback Coalition, about the alleged dumping of sea containers by CRTR of Brockton, MA. [Here is a the original location of the detailed press release ]which describes that "BAN volunteers" staked out the Brockton location, called in the containers, and then alleges that the Indonesian government opened the containers, confirmed BAN's allegations that they contained "hazardous waste", and returned the containers. [This was deleted, here is a link to a publication which picked up the press release in its entirety. I also have scanned PDF copy if they cover this up as well]. 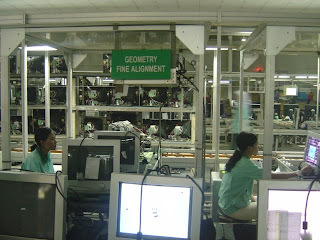 I know (as I have shown in previous posts) that there is more than one very legitimate remanufacturing operation in Indonesia; the largest one in our photo tours was in Jakarta. 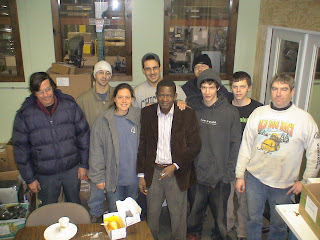 I do not know nor claim to know what the Brockton company put inside the containers. EPA and USA Homeland Security inspected them on their arrival back in the USA, I look forward to hearing what they found. Here is film of a factory we toured in Indonesia (different from the one we have been invited to). Meanwhile, I have been personally contacted and invited to visit the specific factory, the one I can confirm purchased the CRTs from Advanced Global Techology. We can invite people who would be able to verify the factory's claims that they are legitimate, permitted, legal, and practicing proper recycling. I don't know any of those things yet, but I am sure that if given the proper incentives that the refurbishing factories CAN and WILL manage operations in an environmentally sound way. When I was invited to visit similar factories in China five years ago, including one which ACTUALLY bought the Hong Kong monitors circled by 60 Minutes (who claimed to "follow the trail" to Guiyu), I found that the glass was more than half full. I brought an E-steward with me, and a native Chinese speaker and recycling director from UC Davis. We saw screened monitors, like those in the photo on the left, not mixed damaged CRTs like the ones in the photo to the right. The ones on the right would be what you would see in a "toxics along for the ride" situation. The ones on the left, if they come from a recycler who can pass the CRT Glass Test (which BAN also uses), would be completely legitimate. There may be other types of CRT repair and refurbishing operations I don't know about. I heard there are TVs in the Indonesia load, but I also hear that the Indonesian buyer is a TV refurbisher and that they asked for the TVs. So I don't know what I will see. But I have been invited now by both the broker and the factory. That by itself will put me far ahead of BAN and Takeback and NRDC, who have not been to a contract manufacturing factory, and who clearly in their press releases describe horrific backyard burning operations. I would like to bring the CEO and VP of our own Malaysia partner along, to help advise me if the Indonesian factory is "cutting corners", and to assure them that we approach "fair trade" as a two-way street. If it is true what CRTR and Advanced Recycling Technologies allege, which is that BAN notified the Indonesian government that the containers "in fact" contained hazardous waste, and that the Indonesian government returned the containers without opening them or inspecting them, then E-Waste Advocates, who previously had the high ground, will have created a blunder similar to the "global warming" email controversy. We cannot afford false accusations, environmentalists cannot afford self-inflicted wounds, but I cannot afford to be defending "seventy percenters" (if the mix is 30% bad and results in accumulation of waste in a country that cannot afford to take care of it). I am satisfied, having corresponded with Natural Resources Defense Council, that NRDC means well but offered their own quote in BAN's press release about the Indonesia controversy with absolutely no knowledge of whether this was an "informal burning" operation, or an actual example of the very "Manufacturer Takeback" programs which are held as the solution. We should all look forward WR3A's trip to Indonesia. I hope to invite representatives of the United Nations, Basel Secretariat, EPA, and other researchers with me. This will not be a tour of a WR3A vetted manufacturer takeback program, but it will be a tour of a factory which fits the description of the factories WR3A began to partner with some years ago. Postscript 12/10/2010: The BAN, ETBC and Boston Globe have all gone back and deleted or "rewritten" the allegations against this company and the exporter of record. The exporter of record was the same company which was uncovered in the Sacramento Bee "Finds Guys" press release. Here is a link to the Boston Globe editorial written after the press release, which states "Environmentalists say what usually happens is that spent electronics goods are thrown into dumps where poor scavengers risk open-air burning and acid baths to procure gold, silver, and copper. This primitive process, which is exploding in Asia and Africa, poisons the surrounding air and water." So if they stated it, and then withdrew it by deleting the press release, should the Boston Globe place a retraction? This is CBS 60 Minutes all over again.